Startups like Uber -- an app that lets people hail a taxi or car service from their mobile phone -- say they are facing unfair legal challenges from the established players. They call it a backlash against innovation. Cutting-edge start-up companies are crying foul, claiming they're being blocked from entering local markets by established businesses. In fields such as transportation, hospitality, and energy, the old-line industries are evoking laws and regulations to keep upstarts at bay, leading to less choice and higher prices for consumers. But the industries say the rules are there for good reason -- to protect the public. Take the taxi businesses. Uber is an app that lets people hail a taxi or car service from their mobile phone -- sometimes through a regulated provider like a traditional yellow cab or black car service, and sometimes through independent drivers with their own private vehicles. Uber has been rapidly expanding, but company executives say that in a handful of cities, laws designed to protect the existing taxi industry are making it impossible for Uber to do business. For example, in Miami there's a requirement that customers must wait an hour from the time they call for a black car service to the time they can get in the vehicle. There's also a minimum fare of $70. "That law has kept us out of cities where we want to do business, and where people want us to do businesses," said Andrew Noyes, a spokesman for Uber. Some traditional taxi and car service operators in the city say the rules serve a just purpose. The minimum fare is designed to let car service companies make money while meeting the requirement that they field expensive, late-model vehicles and carry $5 million worth of insurance. The minimum wait time is to protect yellow cab drivers, who have to fork out tens of thousands of dollars for a license. An official at Miami Dade County, which regulates the taxi and car service industry, said there is a hearing to change the law set for the end of September. 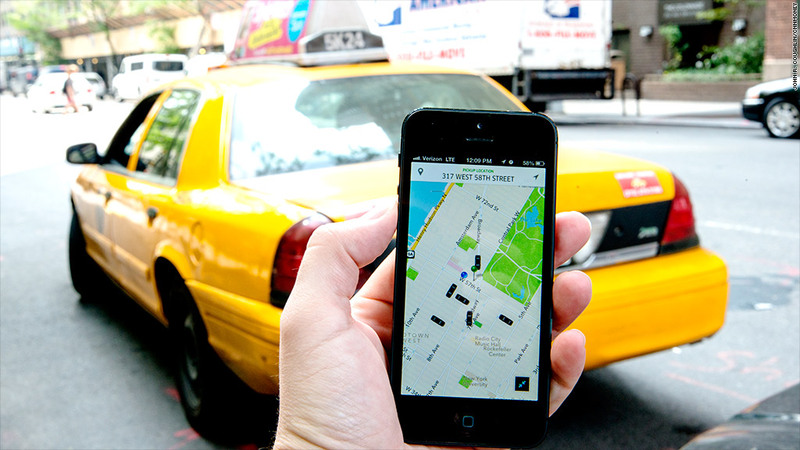 In San Francisco, new ride share apps have sparked outright physical confrontation. Officials at the airport have reportedly gone so far as to make citizen's arrests of ride share drivers, saying they don't have the necessary paperwork to pick people up. The hotel business has also been shaken up by the entry of scrappy upstarts. One of the most well-known, Airbnb, allows individuals to rent out their homes or apartments on a nightly basis. The company has brought its users either significant extra income, or substantial savings on a night's stay. But for the hotel industry, it's created stiff competition. New York hoteliers backed a recent state law banning such "unregulated" hotels. They say the fire and safety codes aren't there to protect the public. They also note that some neighbors of these Airbnb hosts are none too pleased when they find that a total stranger now has a key to their building. Airbnb argues the law is really targeted at illegal commercial hotels -- not individuals renting out their homes -- and is trying to get it modified. But that won't help Nigel Warren, who was fined $2,400 earlier this year for renting out his New York City apartment on Airbnb. Solar energy is another space where new technology is chafing up against the established players. In many places, people who put solar panels on their roofs are allowed to sell any excess power they generate back to the utility at retail prices. That's a key selling point for solar, said Edward Fenster chief executive of Sunrun, a rooftop solar provider. But a lot of utilities don't like this arrangement. If people are harnessing their own solar power, then the utility doesn't have to build new power plants -- which enables them to convince regulators to sign off on rate increases. In Arizona, Fenster said the main public utility is lobbying the regulator to let it pay below retail rates for solar power. It also wants to charge solar customers $150 a month just for having solar panels -- $10 more than the average utility bill in the state. "They don't have a justification for it," said Fenster. "They're just trying to kill the industry." But a spokeswoman for the utility, Arizona Public Service, said paying the retail rate was an incentive designed to help solar in its infancy, and that solar customers often had no electricity bill. But that's not fair, she said, as solar customers are still connected to the grid and use grid power when there is no sun, like at night. She also said the maximum charge would be closer to $100. The utility isn't trying to stifle innovation, but enable it, she said, by ensuring the grid is properly maintained so rooftop solar can continue to expand. The current rules do tend to favor established industry, according to Maxwell Wessel, who heads the innovation group at software maker SAP and was an innovation researcher at the Harvard Business School. The have been able to influence lawmakers for far longer, and they reap the benefits of that, Wessel said. And some of the regulations are important. But he thinks they favor established industry a little too much. "We want regulation that protects the public good, but protecting vested interested slows innovation," he said. "I do not think we have struck a good balance."